The seminary is the place where a man is formed mind, body, and soul into the image of Jesus Christ. The seminarian prays hard, studies hard, works hard . . . and plays hard! In order to become Catholic priest, a man must fulfill three basic requirements: a college degree, 2 years of Philosophy study, and 4 years of Theology study. Some men enter seminary while still in college and so they attend College Seminary. Once they get a degree, they can transfer to Major Seminary. The Archdiocese of Baltimore currently uses 3 Major Seminaries and 2 College Seminaries, briefly described below. Founded in 1791, St. Mary’s Seminary & University in Baltimore is the first Catholic seminary in the United States. For over two hundred years, St. Mary’s has been run by the Sulpician Fathers, a community of priests dedicated to the formation of seminarians. Many holy priests and bishops have been trained here, including Fr. Michael McGivney, the founder of the Knights of Columbus, whose cause for canonization is opened. The founder of the seminary, Bishop Simon Brute, is also begin investigated for sainthood! 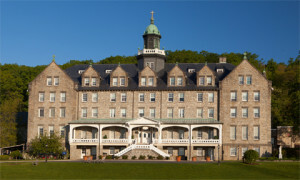 Mount St. Mary’s Seminary, the largest seminary in the country, opened its doors in 1808. Bishops send men from all across the United States to be trained here. It is located in the beautiful countryside west of Baltimore, close to the site of the Battle of Gettysburg. One of the priests trained here was Fr. Stanley Rother, who was martyred in Guatemala in the 1980’s. Seminarians today pray for his intercession, that they might be holy and courageous priests of Jesus Christ. The North American College was constructed in 1855 at the request of Blessed Pope Pius IX. Men from all around the United States go there to be trained as priests. The Americans live together in the College, but study in the different Catholic universities of Rome with seminarians from all around the world. They have opportunity to pray with the Pope, to visit the tombs of saints and martyrs, and to learn the rich history of the Catholic Church in the very place where much of it took place. They also have the chance to compete in soccer against the Italians and Swiss Guard! All Baltimore seminarians begin their studies in the United States. After the second year of studies, some are sent to the North American College to complete their training. All expenses incurred by the college seminarian, including tuition, room, and board, are covered by the Archdiocese of Baltimore. The seminarian is responsible only for an annual school loan of $5000. 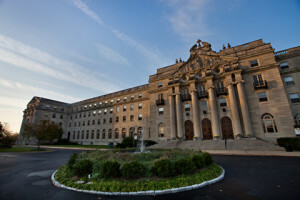 Opened in 2011 on the campus of Catholic University of America, this seminary has grown quickly. Men live in the college seminary but take philosophy classes at Catholic University, a world class university run by the bishops of the United States. The magnificent Basilica of the Immaculate Conception, located in the center of campus, is the largest church in the country. Established in 1942, this college seminary is located next to Providence College, which is run by priests of the Dominican Order. Men live in the college seminary but take philosophy classes at Providence. Currently, the Dominicans are one of the fastest growing religious Orders in the country. Providence College also has a great division I basketball team!